The Dell XPS 15 2-in-1 finally gets a listing on Dell's website. The convertible notebook comes with a choice of Intel 'Kaby Lake-G' Core i5 and Core i7 processors and offers a few other configuration options. Prices start from US$1,499 with financing options directly from Dell. Its finally here, folks. The XPS 15 2-in-1 can be ordered directly from Dell. Some of the issues with the site that were mentioned in the original article are now fixed and you can directly choose from a variety of configuration options. Prices start from US$1,499.99 for the Core i5-8305G model and maxes out at US$2,749.99 for a Core i7-8705G variant with 16 GB RAM, 1TB SSD and a 4K display. If you happen to order one now, the standard delivery date in the US is around April 20. However, for an extra US$25, Dell Express Delivery should hand it over by April 13. The source link below has been updated to reflect the updated ordering page. The Dell XPS 15 2-in-1 (9575) is finally available on Dell's website for ordering. This correlates to what Dell's Frank Azor tweeted a couple of days ago. 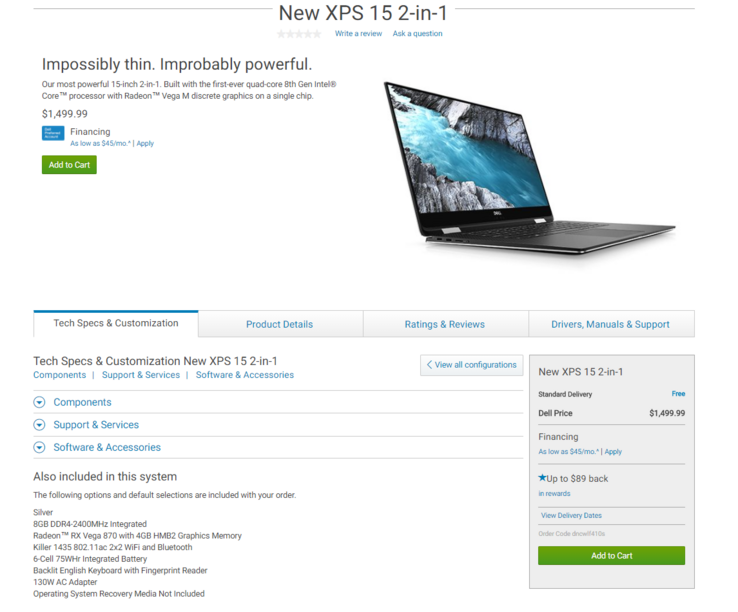 The listing shows the XPS 15 2-in-1 and its configuration choices and optional accessories. There a few caveats with the listing itself but before that let's have a look at what the product page specifies. The XPS 15 2-in-1 can be configured with either an Intel Core i5-8305G or a Core i7-8705G CPU. This CPU belongs to the 8th generation 'Kaby Lake-G' family and sports an onboard Radeon RX Vega M GL discrete GPU coupled to 4 GB of HBM2 memory. The listing unfortunately does not show any RAM options apart from the default 8 GB but we know that the notebook in fact comes in both 8 GB and 16 GB onboard RAM versions with the option of maxing out at 32 GB post release to shipping (RTS). The XPS lineup is known for implementing some of the best displays in the market and at CES 2018, Dell said that the XPS 15 2-in-1 will come in both FHD and UHD display options. However, the present listing shows only the FHD option. Other options include a choice of Windows 10 Home or Pro and a 256 GB or 512 GB SSD apart from standard warranty and bundled MS Office and Antivirus software options. As indicated earlier, there are some issues with this listing. Some of the RAM and display configuration options are not yet visible even though we know that the SKUs do exist. The View all configurations option also does not seem to work as of this writing. It is possible that the listing has been put up a little early as the notebook does not feature in any of the landing pages of the site. The GPU is listed erroneously as the RX Vega 870 instead of the Vega M GL. Apparently, you can checkout if you're ok with the presented configuration but you'd do better to wait till everything on the site works as intended. Given Azor's earlier confirmation and the popping up of this listing today, it shouldn't be too long now. Check out the listing at the source link below and let us know your thoughts.